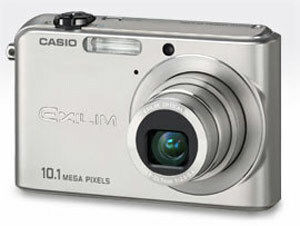 Casio Exilim EX-Z1000 is a digital camera from the stylish series of EXILIM ZOOM digital cameras. Casio Exilim EX-Z1000 features effective 10.1 million pixels on large 1/1.8-inch high-resolution CCD, wide format 2.8-inch 230,400 pixel resolution LCD monitor with maximum brightness of 1200cd/m2, 3X optical zoom, BEST SHOT function, ISO sensitivity up to ISO 3200, Anti Shake DSP, Rapid Flash function, fast power-on, 37 pre-programmed scenes mode, 0.002 second release time lag, high speed picture playback, Quick Shutter function, Auto Macro mode, 9-Point Multi AF function, Direct On function and comes with a Multi-function cradle. More features, specifications and sample images can be found at Z1000 official homepage. ComputerAct!ve (dead link) gives overall rating of 4 out of 5 to the digital camera and concludes that a high resolution – should you need it – is the chief selling point of the Casio Exilim Zoom Z1000, since its other features are fairly average. Still, it’s responsive, looks stylish and is capable of a crisp performance. Steve’s DigiCams concludes that the EX-Z1000 is an awesome addition to Casio’s already popular Exilim Zoom line. With robust performance, great image quality, and loads of easy to use exposure modes, this model will make a great choice for anyone in the market for an “ultra-compact” consumer model. And with a street price of $399 or less, it offers an outstanding value for a 10-megapixel digicam. Personal Tech Pipeline (dead link) writes that EX-Z1000 is clearly aimed at the more-pixels-are-better-crowd, and not at photographers who want to fine tune their photography beyond using presets. One thing to take into account with a 10-megapixel camera, is that the file size is really big. At the same price as the old-and-busted EX-Z850, the new-hotness Casio is packed with extremely powerful features for amateur photography. And even suggests that the digital camera can be used to replace scanner with the availability of preset scene mode for photographing business cards, and another for taking pictures of pictures, or rather old pictures to be precise (the preset “Old Photo” brings faded colors back to life). TrustedReviews gives an overall rating of 9 out of 10 to Casio Exilim EX-Z1000 digital camera and concludes that despite, and not because of, the megapixel willy-waving, the EX-Z1000 is a superb camera. It possesses first class build quality, brisk performance, outstanding image quality and an innovative and easy-to-use control system that makes it ideal for a first-time user. As to whether you really need 10 megapixels, only you can decide. PhotographyBLOG concludes with above average rating of 3.5 out of 5 that the Casio Exilim EX-Z1000 is a frustrating camera. It is one of the best-built, well thought-out, feature-rich and quick compact digital cameras that I’ve ever reviewed. On the other hand, the 10 megapixel sensor is a liability, producing images that look good at first glance, but which upon closer inspection suffer from noise at ISO 200 and faster, purple fringing in many shots, including situations where you wouldn’t expect to find it, and almost completely ineffective anti-shake and high-sensitivity modes. In short, I thoroughly enjoyed using the EX-Z1000, but didn’t like the images that it produced, which is possibly the worst kind of disappointment. The Casio Exilim EX-Z1000 proves that Casio can build an innovative and intuitive camera that rivals the best models from the likes of Canon and Nikon. Unfortunately it also proves that you can’t squeeze 10 megapixels onto such a small sensor without creating some serious image quality issues. The Casio Exilim EX-Z1000 may have grabbed the headlines when it was launched, but unless you only take photos in almost perfect, daylight conditions, and you don’t mind purple edges in your images, then the Casio EX-Z1000 is sadly one to avoid.